Michael Ballanger discusses the current state of precious metal markets. I shall pass along my thoughts on the tenth anniversary of the 2008 bank bailouts, currency chaos and the un-precious metals in no particular order and with no specific agenda. More important, I want to pay tribute to a writer whose work I truly love, Rolling Stone magazine's Matt Taibbi. Taibbi's work reminds me of an era-gone-by when reporters actually reported and where "fake news" was at the least an excuse for the originator to be blackballed from the journalistic fraternity and at the worst a jail sentence. The senior editors in the newspaper business demanded that their reporters verified facts by way of constant scrutinization of sources while chasing down leads for days on end in order to allow something controversial to hit the media screens. Matt covered the "Great Financial Crisis" ten years ago and immediately after that, he was the chap that nicknamed Goldman Sacks "a great vampire squid" whose claim to fame and prosperity was how it was "wrapped around the face of humanity, relentlessly jamming its blood funnel into anything that smells like money." Matt has come out with his 10-year update on the anniversary of the "Great American Taxpayer Rip-off" and I urge all of you to take the time to read it. It is unlike the Wall-Street-sponsored CNBC anchor Andrew Ross Sorkin's account by way of his best-seller "Too Big to Fail" would up glamorized the key criminals in the heist including Hank Paulson, Ben Bernanke and Tim Geithner. They have all since written books about how they singlehandedly saved the financial system from certain peril while conveniently omitting the billions upon billions of free money given to the bankers in bonuses while trillions in real estate and pension losses by Middle America remain. Here is the link and I offer a word of warning: Do not read this near any small children or beloved pets. Your response will be, shall we say, "unwelcomed." The Friday COT was a non-event and therefore all that can be said is that it remains in a massively bullish configuration in the manner of an inordinately stretched elastic band reaching the end of its elongation: one slip-up and the ensuing snapback will be violent and swift. One of the classic buy signals I have used over the years has been the GDX:$GOLD ratio, which replaced the $HUI:$GOLD ratio with the arrival of the ETF's to the financial arena. Gold mining shares often represent a precursor to trend changes in the underlying physical metals and while they do not always do so, they are more right than wrong since I first began to monitor the relationship between spot gold prices and the miners in early 1980s. There have been occasions when they gave false signals and none more glaring than in mid-January of 2016 when the $HUI crashed to 99.17 under the weight of massive forced liquidation by one of the very large oil-sensitive sovereign wealth funds despite rising gold and silver prices and a favorable COT structure. Here in September 2018, it seems that the outperformance of the GDX (Senior Miners ETF) is giving us a clue that the precious metals are itching for a rally and if the COT set-up is any clue, it will be a rip-your-face-off event with Large Spec shorts scrambling for safety while Commercials nudge prices higher and just "out of reach." The highly volatile TSX Venture Exchange has been outperforming the gold and silver markets since mid-August but then again there is nothing surprising in that trend. I learned a great many years ago that the best buying opportunities for the junior exploration issues—the "penny dreadfuls"—usually found lurking in the TSXV shadows arrive about two to three weeks before the kids are back in school but the bell that rings to mark the beginning of the junior exploration season goes off after the arrival of autumn as the lazy days of summer are replaced by "Back-to-Work" psychology and much more active TSXV markets. 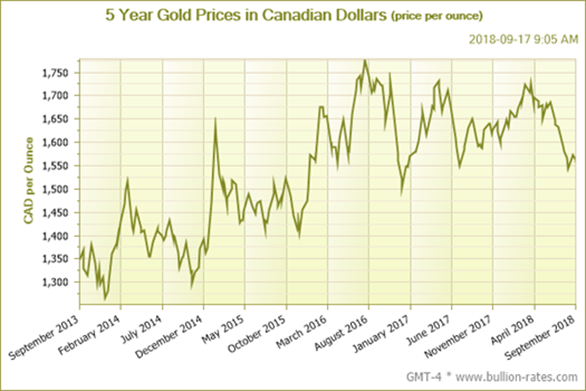 Despite the injection of non-precious metals components in the TSXV index in recent years, gold and silver issues still play a dominant role so the outperformance remains an important indicator and helpful tool in timing the turn in the metals. This past weekend I was fortunate enough to have been able to grab a cellular signal while moored in the lovely Indian Harbour located in eastern Georgian Bay where the sunsets are as good as anywhere in the world and the water as clear as can be. I was able to enjoy three days of +25C weather during which I must have read over 50 research reports by the big banks, brokers and bloggers all waxing eloquently on the "next big trade." What is consistent is that North American investors have a certain bias while Europeans have a distinctively different one. When the topic of gold and silver arises, it becomes blatantly obvious that the singular most important factor in whether or not one should own gold and silver is location, location, location. 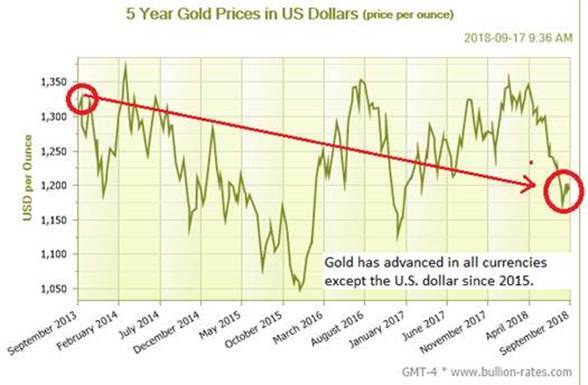 If you pay bills in emerging market locales where currency chaos can arrive at your doorstep literally overnight, there is a profound urgency to shift one's bill-paying currency into gold on a regular basis in order to avoid calamitous declines in one's purchasing power. This not because you expect volatility in your domestic currency; it is because you expect lunacy in the actions of politicians and central bankers in their responses to declining rates of exchange, which THEN results in erosion of the purchasing power of your savings. In other words, politicians purposely debase currencies in order to manage debt and when that debt is U.S. dollar-based, the printing presses are working overtime to make up the shortfall in interest coverage after which they panic when they estimate the length of time it will take to retire the principal. We in North America have been blessed/cursed with relatively strong currencies and with the exception of the massive debt-GDP spike in the late 1970s in Canada, Canadians have never really had to worry that much about hyperinflationary chaos, the likes of which we have seen consistently in Zimbabwe, Argentina, Venezuela and now Turkey. 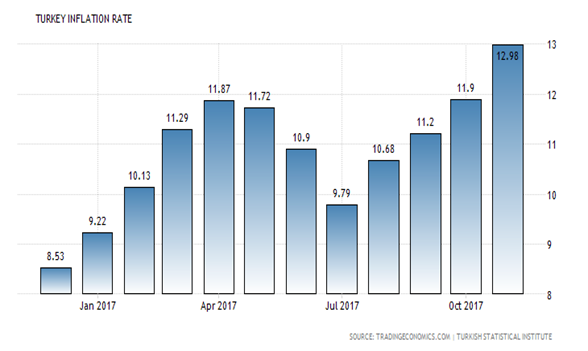 If you were a hard-working Turkish citizen trying like the rest of the world to earn a living and create some savings over time, had you taken 10% of your take-home pay in 2013 and purchased gold every month, you would be staying ahead of inflation and actually thriving. 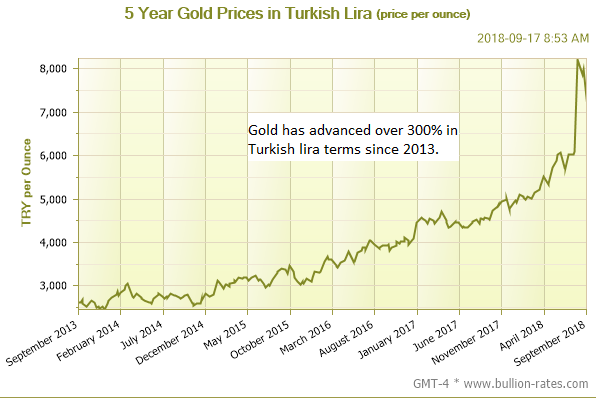 300% increases in gold-in-lira pricing is a survival strategy. 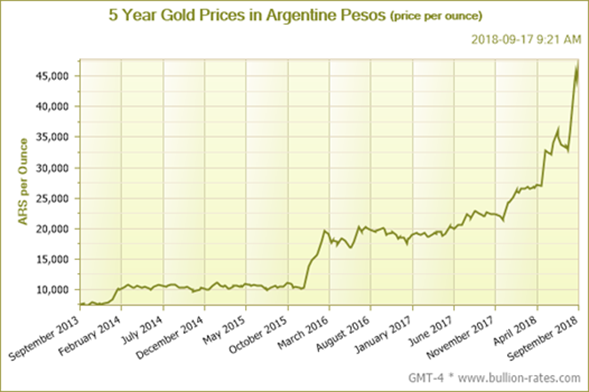 Here are four more charts for gold priced in Canadian dollars, Brazilian real, Venezuelan bolivars and Argentine pesos in which uptrends exist across the board. Citizens living in all of those countries (including Canada) are experiencing domestic bull markets in gold. 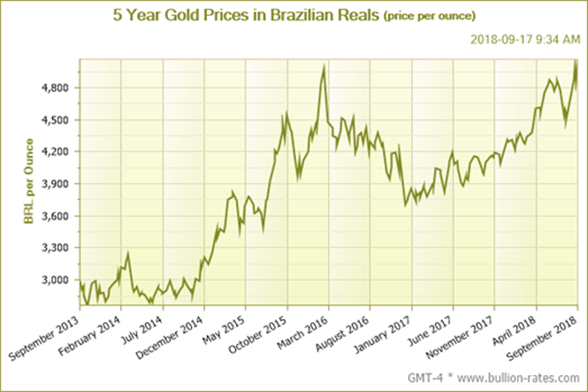 It is obviously most acute in the troubled countries like Venezuela and Argentina but even Brazil is rewarding gold investors handsomely. It seems, my friends, that wherever fiscal profligacy exists, citizens have learned over time that "gold versus paper" is a sound strategy. 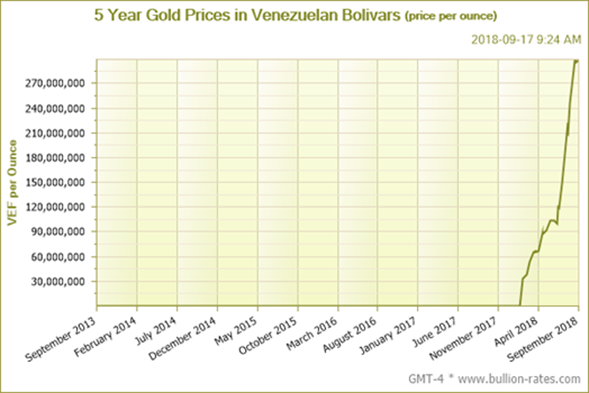 However, the one country that has experienced the worst extremes of fiscal misadventure, at least in terms of sheer magnitude of dollars, has been the U.S. and yet U.S. citizens continue to be penalized for owning bullion as shown in the chart below. We have seen paper after paper and report after report condemning U.S. fiscal policy with the unfunded entitlements in the many trillions of dollars and looming on the horizon. Notwithstanding the gargantuan cost of maintaining a global military machine in order to remain the world's uncontested policeman, the U.S. Office of Budget and Management estimated massive shortfalls in Social Security and Medicare as early as 2020 and yet the U.S. currency continue to reign supreme against the ultimate form of constitutional money, gold. Now, these are all things that you all know and have read before so I offer no surprises in these observations. However, Newton's Third Law states, "For every action, there is an equal and opposite reaction." 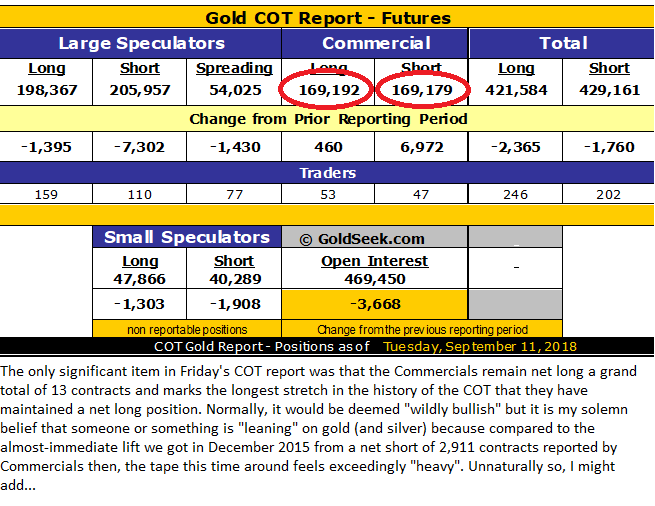 So if gold and silver saw (bullish) extremes in their COT setups in late 2015 and opposite (bearish) extremes occurring in late summer 2016 resulting in price movements in line with normal behaviors, then this was the Third Law agendo ("in action"). To wit, whatever it is exerting pressure to contain price and suppress bullish forces, then it is in direct violation of Newton's Third Law. To hold an inflated beach ball under the surface of the water is an attempt to defy that law and once released, the equal and opposite reactions tends to overshoot, taking the ball out of the water only to gravitate back down as the violence of the reaction dissipates. While I can't give a date and time for the move, logic dictates that such a violent move is indeed coming and when it does, you want to be positioned. The GDX is telling you that; the TSXV is telling you that; the Investors Intelligence sentiment numbers are telling you that; and the COT setup is screaming it from the top of the highest yardarm. Precious metals enthusiasts should ensure that they are positioned accordingly. Images and charts provided by the author. Michael Ballanger Disclaimer: This letter makes no guarantee or warranty on the accuracy or completeness of the data provided. Nothing contained herein is intended or shall be deemed to be investment advice, implied or otherwise. This letter represents my views and replicates trades that I am making but nothing more than that. Always consult your registered advisor to assist you with your investments. I accept no liability for any loss arising from the use of the data contained on this letter. Options and junior mining stocks contain a high level of risk that may result in the loss of part or all invested capital and therefore are suitable for experienced and professional investors and traders only. One should be familiar with the risks involved in junior mining and options trading and we recommend consulting a financial adviser if you feel you do not understand the risks involved.